Finding out what you can afford is one of the fist steps, which can be done by pre-qualifying for a home loan. 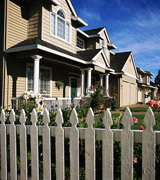 This step will help you narrow your search for both a neighborhood and particular houses. A pre-qualification is a simple calculation that considers several factors, but primarily your income. There are no guarantees with a prequalificaiton, but it will be expected of you when you make an offer on a home.